includes 20 Iranian themed gaming dice. As the Iranian tanks advanced two abreast through the defile, Jazani could see that his tank commanders all had their heads out scanning for potential threats. Just as the number one and two tanks of his lead group were about to leave the defile and enter the open ground beyond, the vehicle on the right erupted in a sheet of flame, and the earth to the left of the other tank leapt geyser-like into the air. The vehicle that was hit stopped, flames and smoke pouring out of the open hatches. The tank on the left and the following four all started to spray the rocky crags with machineguns as they accelerated for the now narrower gap. His tank lurched as it sped up, ‘No puny Iraqi ambush would stop this breakthrough!’ thought Jazani as he switched his radio to the company net ready to urge his men forward. 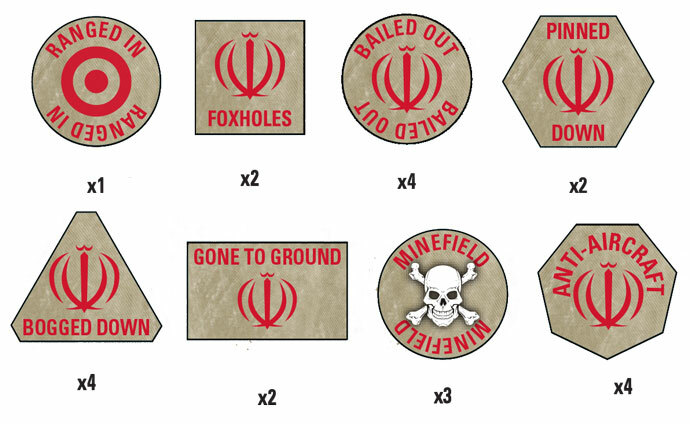 Note: The Iran Coat Of Arms on each die represents the 6.